The only bits visible above ground are a 4" hole to stick the wood in, and the copper barrel. The fire is about 18" underground, and burns very strongly, but sideways! The clay pipe is buried a foot under the middle of polytunnel. This pic's taken from the other end - a couple of CIDPs keeping warm in the middle A big mistake the first time I fired it up was not to water the bed first - the dry soil acted as a good insulator, so nothing really got warm... Watering it a lot helps spread the heat from the hot clay pipe to the soil. The exhaust pops up just outside the polytunnel, with an old aluminium flower pot to put over it when I'm not using to keep rain and wildlife out. The exhaust is only just warm to the touch even when it's burning away at full tilt - all the heat goes from the clay pipe into the soil. I'm using waste wood from my workshop to fire it at the moment, then will move onto the big stack of sticks from cutting the hedges. It burns very hot - difficult to get a good picture, but strange watching the flames burn sideways! I put a big brick over the hole to adjust the draft, and to close it off when I'm done. A short fire of about an hour kept the polytunnel frost free during the week when it was -2C outside. I don't know how warm the soil gets (certainly doesn't feel hot), but the barrel is too hot to touch within a few minutes. I'm happy with it, and the best news - it's now free to heat the polytunnel! Re: Polytunnel rocket stove - finished! It will now be interesting to see how it performs over the winter and just how much work it needs to keep it running! I guess it will be a bit of trial and error to get it right and a steep learning curve even though I guess you have done your homework thoroughly! On the flip side, I hope we have a mild winter and that you won't need to use it too much! I thought you were going to post a picture of you, with a sooty, blackened face and reporting that it didn't work! Cheers - yes, I've still got lots to learn on how to run it... The biggest trick seems to be managing the draft - it burns slow if I close the hole up with a brick to about an inch, and if I open the hole up too much it burns like crazy, and flames out the front hole too... About half closed seems to be working for me today, but still getting the hang of it. Only needed to go up twice today in a ~1h burn - adjusting the draft changes the speed of the burn, so I can load it up and do something else for a bit. A quick check about half an hour ago shows the soil outside the polytunnel is at 5 C, soil inside the polytunnel above the exhaust pipe is at 12 C. Fire went out at 6pm. If the fire is burning underground - how do you get to the ashes to empty it? “I do not fear death. I had been dead for billions and billions of years before I was born, and had not suffered the slightest inconvenience from it.” Mark Twain. Is this a similar way to how the romans used to heat their underfloor heating in their villas, just on a smaller scale? Also, I take it that this is what Flounder is aiming to build for "a fiver"? Why did my mum call me Keith. Springy wrote: Is this a similar way to how the romans used to heat their underfloor heating in their villas, just on a smaller scale? Much smaller than a Roman Hypercaust but the principle is somewhat similar. 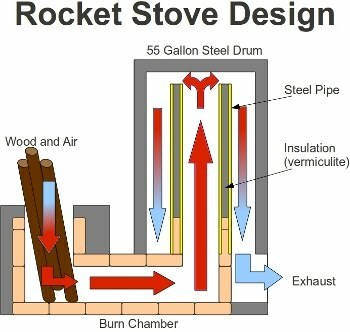 Hypercausts needed to be tended like furnaces and created lots of waste from using huge amounts of wood but these are meant to use much less and actually burn up everything leaving no ash behind, even the smoke burns in an effective rocket heater. big round of applause for that man,just a suggestion,would backfilling around the pipe with chippings give you a better thermal mass ensuring heat was delivered for longer periods? I echo what the others have said, a brilliant set up The amount of branches I take to the recycling centre during summer/autumn would probably last me all winter If I can find somewhere to store it. I think I would have the fire pit outside to avoid losing valuable space inside, and consider using some sort of fins on the clay pipe to distribute the heat more evenly. Too late for this year, but definately something for a project for next summer/autumn. A bit worried about having to water the soil unless you have a waterproof membrane to stop it evaporating out into unwanted humidity. Thanks for the kind comments everyone. I expect you could build the thing for free, as you can reuse and recyle stuff. My copper barrel was waste, the bricks were surplus from another project. The problem with building the thing outside is that steel and iron will rust quickly - that's why I used stainless and copper. If you're good at scavenging, you could make this very cheaply. It produces almost no ash - you just empty the ash out by putting your hand down the feed hole and grabbing it. Bit messy, but simple. I built a little ash pit at the bottom of the feed hole, and I get about a mug full of ash from two builders bucket loads of wood. The ash pit needs emptying every two/three fires so far. A really nice piece of engineering Carl , can't wait to see your results next spring. Well done Carl you solved the space thing well by sinking it, can't wait to get mine up and running, which I will shortly....soon....I sure!